On Sunday 26 November 2017, the concert at the Conway Hall (part of the hall's long running Sunday Concerts series) was given by Julian Perkins and Sounds Baroque with soprano Anna Dennis, performing an attractive selection of songs by Henry Purcell, alongside instrumental music by his contemporaries Francesco Corbetta, Giovannia Battista Draghi and Marin Marais, plus two harpsichord pieces by Stephen Dodgson. I was there to give the pre-concert talk, but enjoyed the concert so much I thought I would write about it. Anna Dennis was unfortunately recovering from illness and so the programme was altered slightly, reducing the number of songs and adding some instrumental pieces by Marin Marias instead. The instrumental ensemble consisted of Julian Perkins (harpsichord), Henrik Persson (bass viol) and James Akers (theorbo and guitar). We started with a group of Purcell songs, Sweeter than Roses, On the brow of Richmond Hill, Cupid the slyest rogue alive and She loves and she confesses too. With her rich timbre and plangent tone, Anna Dennis brought a rather sculptural quality to the vocal line in Sweeter than Roses, making the piece almost dramatic at times, whilst On the brow of Richmond Hill had a charming sense of narrative. Cupid, the slyest rogue alive was wonderfully characterful, but powerful too, whilst She loves and she confessess too was a toe-tapping piece over a ground bass. Francesco Corbetta (1615-1682) was one of the 17th century's greatest guitar virtuosos and he came to London with Charles II on the Restoration and he even pops up in Samuel Pepys' diary. His Suite in C, played on the baroque guitar by James Akers, was a three-movement dance-based piece. The opening Allemanda was stately, and the tone of the guitar gentle and subtle, with Corbetta introducing a wide variety of textures into the musc. The Corrente was gracefully rhythmic whilst the Sarabanda was surprisingly lively and very engaging. Henry Lawes (1595-1662) was an older contemporary of Purcell, Lawes had worked at the pre-Restoration court and returned at the Restoration, writing a piece for Charles II's coronation. 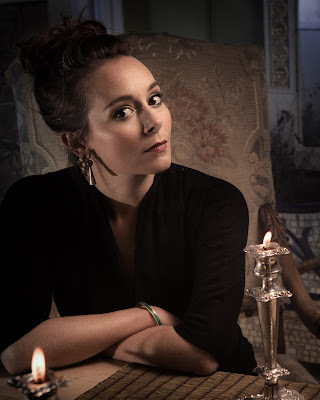 Anna Dennis sang two of Lawes's songs, No Reprieve which was a striking piece full of plangent melancholy, and the finely lyrical A Lover's Legacy. Next came a pair of pieces by Marin Marais (1656-1728), from his Pieces de viole, Livre 3, played by Henrik Persson and Julian Perkins. The first was elegant, with Persson's bass viol providing lots of singing tone and lively string crossing, and the second was stately and sonorous. The first half ended with one of Purcell's finest songs, the beautifully affecting O Solitude setting a poem by Katherine Philips (1631/2 - 1664), 'The Matchless Orinda'. Anna Dennis made the piece elegantly plangent. The second half opened with a harpsichord solo from Julian Perkins. He played a suite by another of Purcell's London-based foreign contemporaries, Giovanni Battista Draghi (1640-1708), another composer who pops up in Samuel Pepys' diary. Draghi' Suite in C was a delightful sequence of dance-based movements, moving from the fluidly elegant to the stately and majestic, and ending with a delightful jig! Perkins followed this with a pair of harpsichord pieces by the contemporary composers Stephen Dodgson (1924-2013), Plush and Roses opened with similar feel to the period pieces, but there was also Dodgson's very particular combination of harmony and timbre. And this fascinating harmonic world also characterised the busy moto perpetuo of The Worm. We finished with another group of Purcell songs. Love arms himself in Celia's eyes started in a vigorous fashion, with an engaging sense of the poetry, whilst Celia's fond was full of charm and a nice naturalness to the shaping of the melody. Oh! fair Cedaria started in free rhapsodic manner, with a lovely flowing melody over ground bass as the central section before the rhapsodic ending, creating a powerful effect. Finally we had the engagingly characterful 'How blessed are the shepherds' from King Arthur.